Turbine especially Closed Cycle Gas Turbine is the best prime-mover used in power generation plant. If you are related to engineering field, you better know the turbines are classified in many different ways. Out of that classification, constant pressure gas turbine plants are also sub-classified as open cycle and closed cycle gas turbine plant. Every type of turbine has their own advantages and disadvantages. 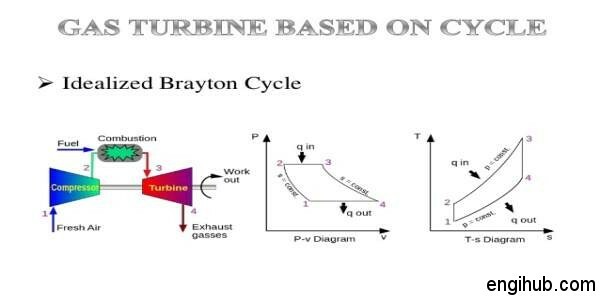 Hence here I will share some advantages of closed cycle gas turbine with you. 1) For a given output the size of the compressor and the turbine are very small. This is all happened due to the low specific volume of air which enters into a compressor, as air is pre-cooled in pre-cooler. Also, the pressure at the inlet to the compressor can be kept well above the atmospheric and maintained around the whole cycle. 2) There is no corrosion and accumulation of deposits of carbon or tar on the blade and nozzles of the turbine. Hence no internal cleaning required. 3) Any fuel of high calorific value may be used, as the products of combustion do not mix with the working fluid. 4) By making an inert gas like helium as the working medium, use can be made of materials in the turbine design, like molybdenum alloys. This has high-stress properties at an elevated temperature above 1000 degree centigrade. By such means, the Turbine Plant efficiency at over 50% can be achieved. 5) The waste heat of the combustion gases from the heat and reheated can be further used for heating water. This can be used for hot water supply for an industrial or domestic purpose. There are some other advantages also, but above are the most prominent advantages of closed cycle gas turbine.